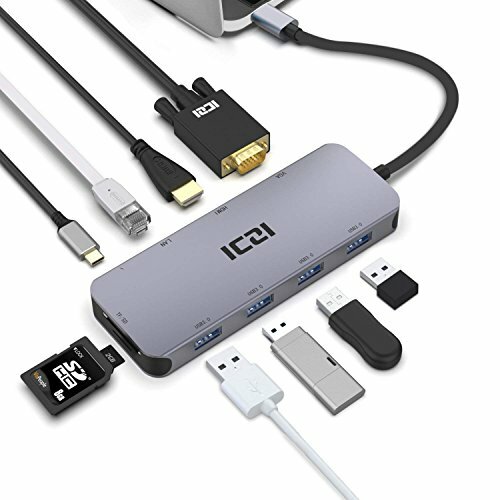 ICZI 10-in-1 USB C Hub, HDMI Hub for TV, is a powerful and compact. Simple design of Aluminium Body with dark Grey Surface. It has 4 USB 3.0 ports, HDMI, VGA, LAN ethernet port, SD and micro SD card slots, USB Type C Power charging port. Small but functional. Under experiment, it shows a stable connections in no matter business, presentation or family use. With ICZI USB Hub, it is possible to combine HDMI VGA adapter, ethernet splitter, TF Micro sd and sd card reader, usb 3.0 hub together. Expand the Type C port to various kind of ports you need. Also work with phones which have DP Alt Mode such as Samsung Galaxy S8/Note 8/S9, Huawei Mate 10 and so on. 1.It is recommended to connect the hub to your computer before connecting devices to the hub. 2.The USB C port on your computer should support video output and Power Delivery for the HDMI, VGA, and Power Delivery ports to function. 3.When you use the USB C power port to charge your MacBook Pro 2017 or other compatible USB Type-C PD laptop, please use the original laptop power adapter(65W highest) or 39W (at least) power adapter. 【PD Function】 Support Charging laptop with original laptop PD charger, highest allowed power is 65W.